Who can deposit materials in Scholars Junction? Why should I deposit my work in Scholars Junction? What can I submit to Scholars Junction? We impose no restriction on the file size of your contribution. However, when submitting items via the IR's web interface, your limit per file is 2gb (gigabytes), as that is the maximum size that most connections will successfully support. If you have larger files, or a large collection of files, please contact us to discuss your options. These formats can be used in the future or can be easily migrated or emulated. MSU Libraries commits to keeping your data accessible. There are several ways to contribute your work to Scholars Junction. Best for single items or small files. Log in to your Scholars Junction account. Once you have logged in, the Submissions link will appear in the sidebar under "My Account". Click this link to begin. The next screen asks you to describe your submission. Provide as much information as possible; the more thorough you can be, the easier it will be for researchers and the general public to find your work. The next screen will allow you to upload your material. An "item" in the IR can contain multiple files; for example, when you deposit a dataset, you can also include a ReadMe file with usage instructions. The final step is to read and agree to our distribution license. 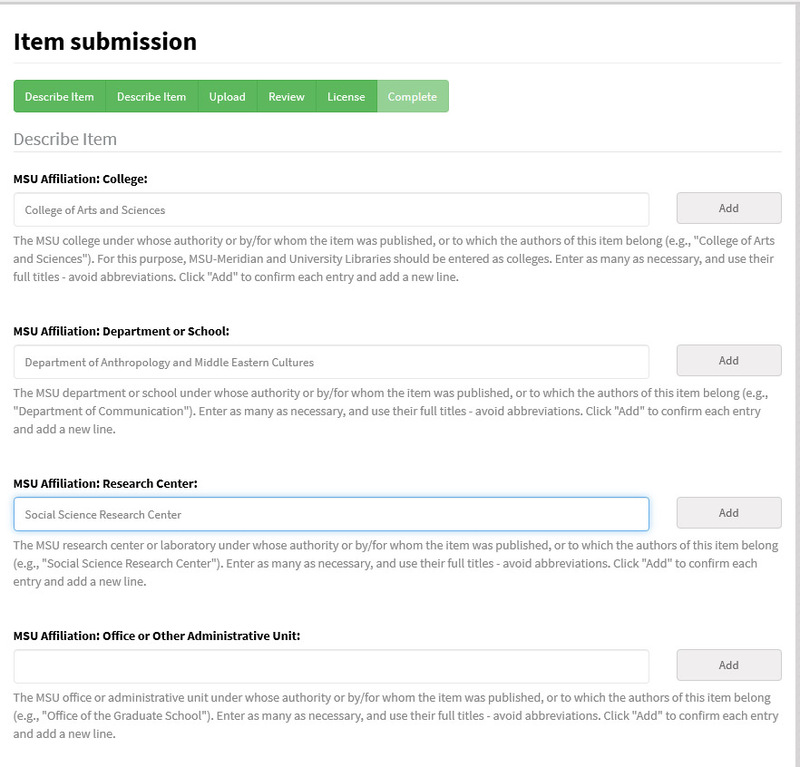 Click "Submit" to finalize your submission and send it to the IR admins for approval. Once your submission has been accepted, you will receive a confirmation email with a permanent link to your item. You can stop and save your submission at any time - simply return to your Submissions page when you're ready to continue and finalize your submission. For collections of material or large files, or if you are having trouble submitting via the web interface. Tell us about yourself and your materials. Staff will respond to you as soon as possible to arrange the transfer of files. You can either download the latest metadata template and describe your materials yourself, or work with us to create metadata. Staff will upload your materials.